With DoBox you can now connect to more external devices like never before. 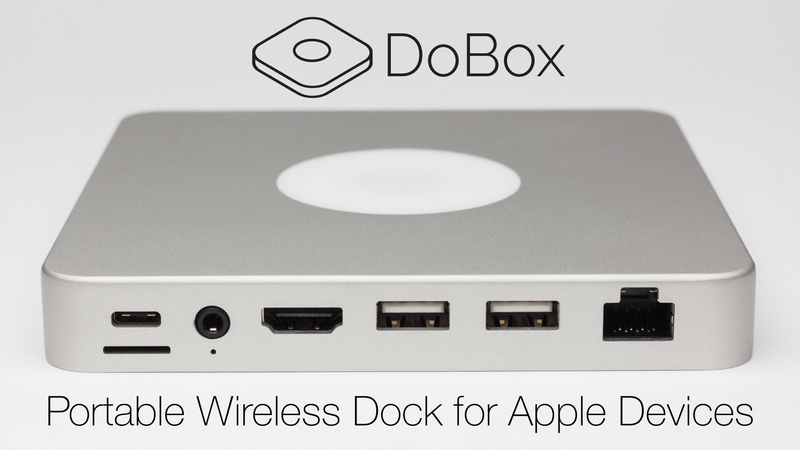 You don’t need a laptop for serious work any more, DoBox turns your iPad or iPhone into a MacBook Pro. The DoBox has multiple ports to connect an internet cable, flashdrives, hard drives, keyboard, printers, TVs, projectors, monitors or speakers, and use them wirelessly. What can you do with the DoBox? You can backup all your photos, videos and documents. The DoBox comes with 32 or 64 GB internal storage. The DoBox has multiple ports to connect an internet cable, flashdrives, hard drives, keyboard, printers, TVs, projectors, monitors or speakers, and use them wirelessly. Create a secure Wi-Fi connection from cable internet access or public hotspots. You can use DoBox as a wireless router, as well. Take it anywhere with you and even charge your phone or tablet. It comes with a Built-in Lithium Ion Battery to charge your devices from USB. Play your favorite music on any speaker with AirPlay, or stream videos to any display or projector from our app. DoBox supports audio and video playing through HDMI. 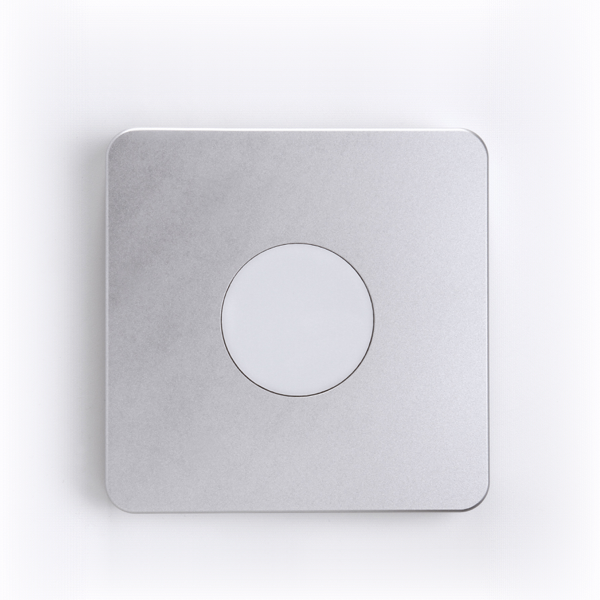 With the DoBox you can use your Bluetooth devices like the magic trackpad or other Bluetooth mouse, keyboard, speaker, etc. The DoBox has a built-in micro SD card reader, so you can import your photos and videos from your favourite camera. You can view or edit your documents or share them with others wirelessly and securely offline. That’s not all, we also thought about the developers. What do you want to use the DoBox for? Be creative, you can do it with DoBox! You can develop and install your own Swift apps for DoBox. 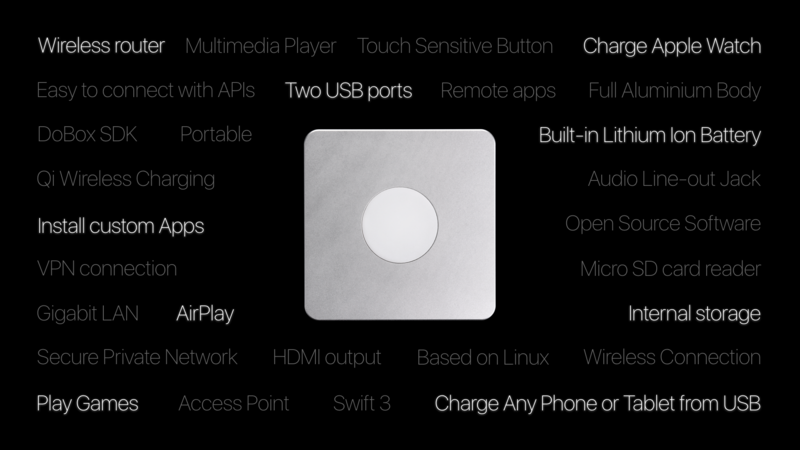 It comes with a hackable, open source software and SDK. This way, you can easily use its ports and functions in your app.